Hierodula is one of the most frequently inhabitant of terrariums, like Sphodromantis. They belong to the normal- type- mantids and mainly the females are big and robust. Hierodula lives in damp- warm forests, where they can be found in the leafage. The long pronotum and the pastel green colour are typical for this species. Hierodula are very agressiv and just Larvae (L4/ L5) can be kept together, but a early separation is recommended. At present, at least 105 species are described, e.g. Hierodula membranacea (BURMEISTER, 1838), H. patellifera patellifera (SERVILLE, 1839) and H. tenius (GIGLIO-TOS, 1912). 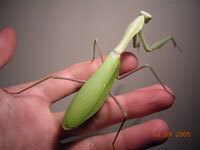 Hierodula is very easy to keep and to breed and also suitable for beginners.